As per usual, I took a few days off to go visit my family in Seattle over Christmas. 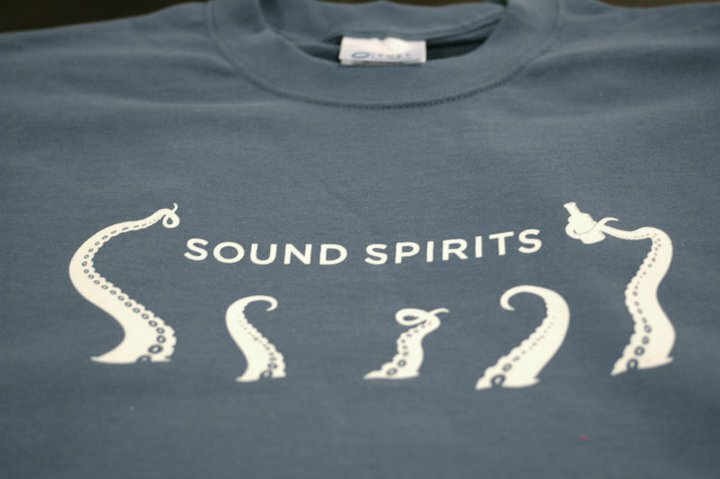 On Boxing Day we all decided to try the city's first distillery, Sound Spirits. Noticeable only because of the tentacles painted on the wall, the distillery is tucked in between two other businesses and is somewhat easy to miss while driving down W 15th Ave. Started by Steve Stone about three years ago due in part to the fact that Steve met Christian Krogstad of House Spirits. After putting together a business plan, acquiring space and the necessary permits, the distillery is now up and running. So far he has put out a barley-based Ebb + Flow vodka and is also doing an Ebb + Flow gin, which was completely spoken for by the time we got there. The gin was, incredibly good and smoother than any other I've tried. While I like drinks a lot, straight liquor usually makes me sputter a bit, but that gin had barely any burn at all. The particular batch we had (the first production run) clearly still had some rough edges to work off as it was a bit cloudy, probably from the citrus oils coming out of solution when the gin was brought down to proof. But I'm not one to care so much about appearance, especially when the flavor is good. The E+F gin is definitely in the New West mold, with subdued juniper and a fairly citrus-heavy flavor profile. While none of the other botanicals jumped out at me, it seemed to be a nice and balanced mix. This is something that I could easily imagine drinking with a couple dashes of bitters and nothing else. While I'm normally loath to make the "this is too good for cocktails" claim, any drink you put it into would be better off highlighting the gin rather than swamping it. We also got to try an experimental herbal liqueur that Steve described as harkening back to spirits like Chartreuse or Benedictine, so it's distinctly sweet, floral and herbaceous. While I didn't hear anything about a release date, I'm really looking forward to trying that liqueur again. Bonus points if the price point is a tick bit lower than either of those established products, which hopefully won't be too hard to do. 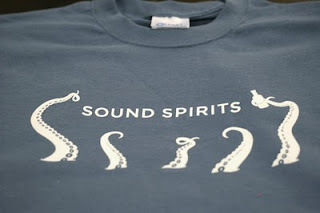 Overall, I was quite impressed with the products that Sounds Spirits is putting out. While it's clearly early days, there's a lot of potential and I'm looking forward to seeing what they do in the future. Here's to the expansion of distilling in the Northwest! As I've noted before, Gary Regan's The Joy of Mixology is one of the books that helped to send me down the path of cocktail nerdery. Though nominally aimed at aspiring bartenders, this is an excellent book for anyone who wants to understand the theory behind cocktail recipes. The book opens with a condensed history of cocktails, going all the way back to the 18th century when cocktails emerged as a drink form in Colonial America. As Gary points out, the cocktail is one of the few culinary inventions that is entirely unique to America rather than being derived from imported ideas. In my opinion, the most useful aspect of this book is the way that drinks are broken into families and presented in spreadsheet form to show how changing the base spirit or an ingredient can produce an entirely new drink. For instance, the Margarita and Daiquiri are all in the sours mold of spirit, sour and sweet, with different spirits (tequila vs. rum) and sweeteners (orange liqueur vs. simple syrup). Understanding those foundations allows one to easily swap one ingredient for another to create new drinks. This has led Regan to create new cocktails to fill "holes" in the cocktail canon where there is an obvious and easy swap that for whatever reason had previously not been made. 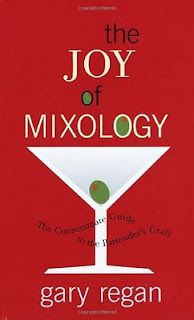 The Joy of Mixology would be the first book I would tell someone who wants to learn more about cocktails to buy. It contains all the basic recipes you'll need to keep yourself and others happy. There's plenty of technique and recommendations for equipment you'll need. And it will give you a huge leg up on how to making your own cocktail recipes. If it's not on your shelf yet, go out and buy it right now. 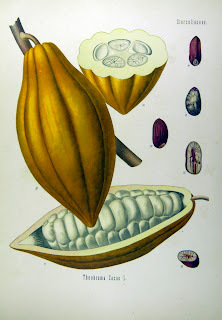 One of my first experiments in making my own ingredients was an attempt to make chocolate bitters. I was fairly excited to read about Fee's Aztec Chocolate Bitters and Bitterman's Mole Bitters. Unsweetened chocolate seemed like a perfect compliment for a lot of drinks, especially those containing rum or tequila. However, the reviews of the Fee Brothers product were less than stellar and the Bitterman's product runs $18/bottle, which seems pretty steep to me. Since my local store for spices, Limbo, carries cacao nibs, I decided to try making them myself. While I was less than impressed with the results, it came to me that the same flavors would also work really well as a spiced rum. So I tossed in some Appleton and let the mixture soak for a week. The results were fabulous. Deep chocolate flavors surrounded by a spicy kick. After that batch was finished, I made another batch with fresh ingredients. That worked out fairly well, though the chocolate was somewhat subdued and the chili flavors were more predominant. My guess is that because the spices extract at different rates, there was more chocolate than spice flavor left over in the once-used spices in the first batch. Either way, it's really tasty and featured prominently in the drink I made for the last Mixology Monday. Combine all spices and grind lightly with a mortar and pestle. Infuse the rum for ~1 week or to taste. The spices can be reused at least once more after filtering. This is a really tasty drink and a great one for the holidays. Imagine a chocolate-dipped spiced orange that's full of alcohol. The Jamaican rum adds some funk, the citrus juices keep it tart and the spiced rum brings a whole host of flavors. 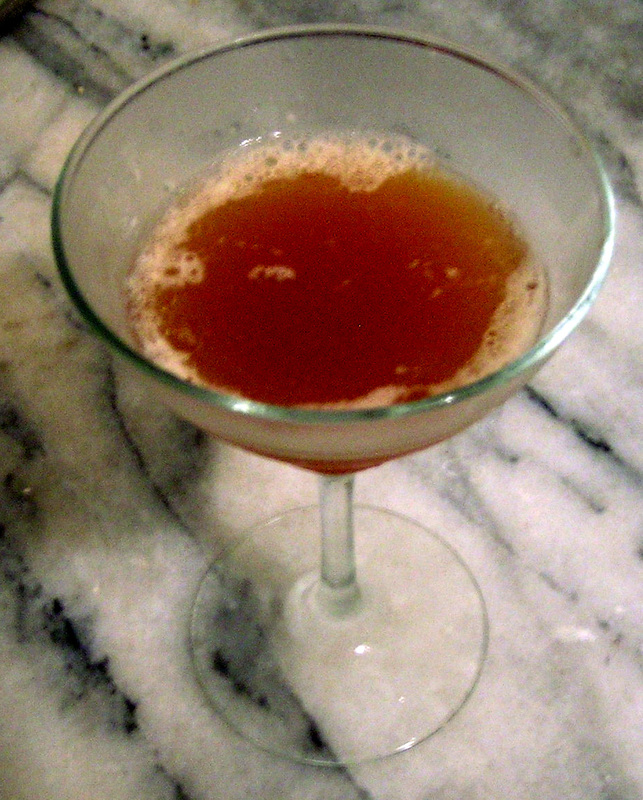 For a liqueur, the Shrubb is very fruity, but drier than one would expect. Depending on how sweet you like your drinks, the extra simple syrup may or may not be necessary. While other orange liqueurs won't work in quite the same way, something like Cointreau might be a decent substitute. No matter what, this is another example of how tiki-style drinks can take a fairly wide array of flavors and meld them into a coherent whole rather than a muddy soup.